Within the inquiry teaching of Theory of Knowledge, teachers and students enter topics through questions and discussion. Teachers do not predominantly tell. They ask — and introduce activities that raise important TOK concepts. They guide students through exploration of ideas and encourage them to develop their own critical skills as they investigate ways of knowing and areas of knowledge. What is the place of a course book, then, within inquiry teaching? The IB Theory of Knowledge Course Companion is designed to be effective in discussion-based teaching. The book provides roughly a hundred activities for classroom discussion on topics throughout the course. It also punctuates chapters with questions for student reflection. For building ideas sequentially, it offers useful visual schema to connect discussions with a growing understanding of TOK topics. Throughout, the book emphasizes the process of inquiry and the critical thinking essential for shaping reliable responses to knowledge questions. 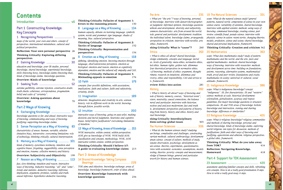 Flowing around the boxed activities, interviews, comments, and images, the chapter text then provides background on the central concepts associated with each topic and the major ideas relevant to TOK. It ensures that teachers and students have a resource and a common reference point for concepts and their connections. The book is also designed to be flexible – so that teachers can select chunks of it to fit the order and emphasis of their own courses, and can easily substitute current knowledge “stories” (such as those treated in Eileen Dombrowski’s TOK blog) for the ones which illustrate points in the book. The book is accessible and friendly for students. For one thing, it’s written at a broadly appropriate level. For another, it includes numerous comments from IB students and longer interviews with IB graduates who are now experts in their areas of knowledge — with their photographs. In this book, knowledge has “a human face” — many human faces, international ones. 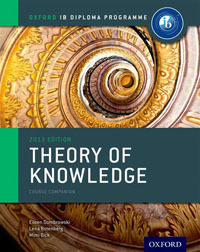 Last, the IB Theory of Knowledge Course Companion gives practical help toward assessment. The final chapter guides students (in 8 steps) toward a good presentation and (in 6 steps) toward a good essay. It distils considerable teacher experience into advice and encouragement. If you want to see more, you can check the website of Oxford University Press: Eileen Dombrowski, Lena Rotenberg, Mimi Bick. Theory of Knowledge Course Companion, 2013 edition. Oxford University Press, 2013. Download the Table of Contents and Introduction to have a look at what the book treats.